Factory direct sale,100% high quality,we won't let you down. Its soft and gentle light is good for your eyes;. 1 x Night Light Lamp with suction pad. as a gift, bars, cafes, restaurants, wedding, party and other romantic places. Material: ABS LED;. hope you could understand. Energy-saving and useful: it make your bathroom easy to access via the auto-sensing device, smart and considerate. Color rotation (8 colors work 120 seconds, each random color works 15 seconds, you can also fix a color). Energy-saving and useful: it make your bathroom easy to access via the auto-sensing device, smart and considerate. One cycle of the lamp is 120 seconds. If the person walks but the light has already started to sense, it will not wait until 120 seconds before the sensor is off. 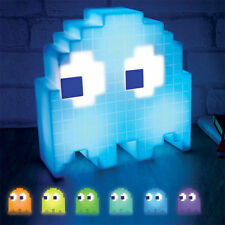 Feature: Eat beans ghost light USB color change mood light 16 colors and 2 modes Reaction to music Light measures approx. 20 x 20 x 7 cm Includes mini-to-USB cable Rated output 5V DC 500mA Packing list: 1 x beans people led light 1 x USB cable. Energy-saving and useful: it make your bathroom easy to access via the auto-sensing device, smart and considerate. 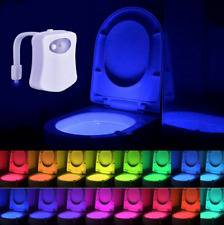 1x Bathroom seat light lamp. 8-Color light emission: 8-color light in turn, each color for 15seconds randomly, 120seconds overall for a circle, you can also fix one color you desire. Looks like a real rose! weight: about 31g. Made of rubber, featuring a praying girl and boy with a candle between them. The night light still works as shown in photos. It fits on the rim of any toilets. No more missing your target or stumbling around the bathroom in the dark. Pressing the button, you can change the lighting colors. The sensor duration is about 120 seconds. Cute Frog Night light. Bright and energy saving. Color: Colorful. Auto color changing. Jazz up your room, dorm, bar or car. Built in LED. 1Pcs LED light. Battery: 3 x button cell AG13 (include). Its soft and gentle light is good for your eyes;. 1 x Night Light Lamp with suction pad. as a gift, bars, cafes, restaurants, wedding, party and other romantic places. Texture bybackgroundcity. Material: ABS LED;. It is water-proof and shock resistant. Functional: Taclight has built-in zoom function and high-powered bulbs are 40X brighter than your regular flashlight with it's atomic beam (5 nautical mile visibility). NIGHTLIGHT OIL LAMP. MINI HURRICANE OIL LAMP. Made in Soviet Union from early 70's. Works with 220V. Beautiful plug-in night light with on off switch. Uses C7 light bulb (included) UL listed. Very good condition. Size: 3” tall and 3.5” wide. Dark Brown color. Made in USA. Hyalyn Vintage Cadillac Nite Lite Night Light . Condition is Used. Possibility a limited number made or experimental piece. In good condition some paper missing on base. Unmarked. Bought at an estate sale in Hickory NC where hyalyn was founded. In working condition. 7 inches tall. Add a decoration and softly illuminate to bedroom. Tender LED light, not too bright to interfere sleeping. Included: 1 x Night Lamp. Color of the lamp: Transparent. Christmas trees-shaped design. 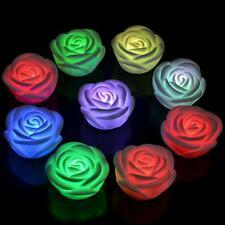 Iridescent LED light, brings you many colors. 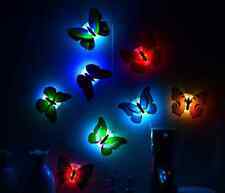 BOXED BEAUTIFUL VINTAGE JOAN BARKER ENAMEL GLASS ART 🦋 FLORAL ❤ NIGHTLIGHT! VINTAGE 1950's HOWDY DOODY NODDER NIGHT LIGHT LAMP TV PUPPET TESTED AND WORKS. Condition is Used. Shipped with USPS Priority Mail. See pics for details. Plugged it in and it lights right up. You get the exact item in the pics. Now I Lay Me Down To Sleep Vintage Child’s Prayer Lamp Works!. Condition is Used. Shipped with USPS Priority Mail. The lamp works wonderfully. It shows minor scuffing to the front but has no major damage. Forward any questions! Marvel Iron Man 3 Hand Glove 3D Deco Wall LED Night Light. Use the Hanger Holes on the Back Of the Hand Or Set On a Shelf. Original Soviet Russian legendary night lamp, Owl - Eagle-owl. made in the USSR, 1989 Last Century. Simply fairytale lamp from the distant past! A condition on a REAL photo. Has sticker on bottom that says “Underwriters Laboratory/portable lamp/Aladdin Giftware L.A., Calif.”. Hand painted. Lamp works. Music box plays when you rotate the blades. It makes a nice conversation piece. There ’ s a hole in the bottom to put the light in. Light not included. THIS IS A VERY NEAT LIGHT UP LETTER. SURE TO GUIDE YOU IN THE DARK. CLEAN, NICE AND LIGHTS THE WAY. BATTERIES ARE INCLUDED. STANDS OR HANGS. It is a porcelain hand painted teapot. It is probably a china pattern. There are flowers on a white background and embellished with gold trim. It is in excellent condition. This square night light is 3" x 3" it is 4 1/2" tall with socket and is over 1 1/2" thick the perfect size and shape for any room in the house. The porcelain walls are very thin so the light will shine through and gently light up any room. Cute Tortoise Night light. Bright and energy saving. Auto color changing. Jazz up your room, dorm, bar or car. Built in LED. 1Pcs LED light. Battery: 3 x button cell AG13 (include). Note: The real color of the item may be slightly different from the pictures shown on website caused by many factors such as brightness of your monitor and light brightness. Looks like a real rose! weight: about 31g. condition: new. It's a very cool little piece that has a nice orange glow to it. Cute Frog Night light. Battery: 3 x button cell LR44 (exclude). Bright and energy saving. Auto color changing. Jazz up your room, dorm, bar or car. Built in LED. You can follow below process to chontact us. JOHNNY DEPP. CHARLIE AND THE CHOCOLATE FACTORY MOVIE NITE LIGHT. NEW ON CARD. From the 2005 Johnny Depp movie by Tim Burton. Charlie and the Chocolate Factory. Chase away the darkness with our new Agate LED Night Lights. Can be used in your babyroom, bathroom, balcony, aisle. - Made from a nice slice of Original polished agate slice that gives off a gentle, soothing and relaxing glow. Made from a nice slice of Original polished agate slice that gives off a gentle, soothing and relaxing glow. - Chase away the darkness with our new Agate LED Night Lights. Can be used in your babyroom, bathroom, balcony, aisle. Ibis & Orchid "Lilac " Night Light are beautifully crafted, cast in quality crushed marble, and expertly Hand Painted. You will not be disappointed!